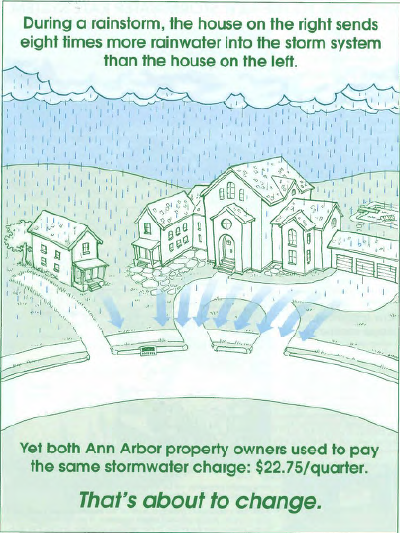 An ad explained changes to the funding structure of Ann Arbor’s stormwater utility in 2006. A stormwater utility is a dedicated funding source—essentially a fee for service, just like an electricity or municipal water bill—used to support a management system for stormwater (the water that accumulates and picks up pollutants when it rains). These utilities began cropping up in the 1970s to fund flood control programs and proliferated in the 1990s when new pollution rules required cities with over 100,000 people to more closely regulate their stormwater. Today, there are at least 400 stormwater utilities in the United States. Ann Arbor’s stormwater utility raises over $5 million for the City each year, financing both basic pipe and infrastructure maintenance and larger projects, like a wetland stormwater retention area at Mary Beth Doyle Park. 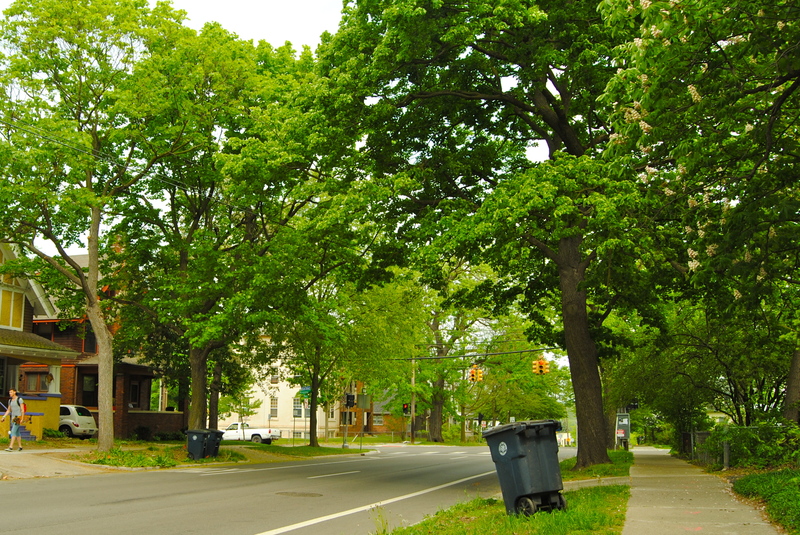 It also serves as the main source of funding for the urban trees program, which aims to increase the City’s urban canopy from the current 32 percent. Projects like these have multiple benefits that increase the City’s resilience: trees absorb stormwater, reducing flood impacts and pollution, but they also provide shade, reducing temperatures by as much as 4 degrees Celsius. These natural stormwater sponges may become increasingly important as climate change makes Ann Arbor a wetter, hotter city. A study by the Great Lakes Integrated Sciences and Assessments Center (GLISA) found that observed mean annual precipitation in Ann Arbor from 1980 to 2010 was 37.4 inches—a 25% increase over the mean observed annual rainfall from 1950 to 1980. 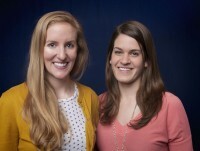 Though the Great Lakes region experiences fewer catastrophic precipitation and heat events than many other areas of the country, according to Beth Gibbons, the Cities Project Manager at the Graham Institute, climate change may be more like a “death by a thousand cuts” for Midwestern cities that have dwindling resources to begin with. In Ann Arbor, the stormwater utility creates a secure funding stream for projects that in turn enable the city to more easily handle expected increases in stormwater. “Tackling stormwater issues is something that makes sense under the current climate and makes sense to alleviate impacts of larger storm events predicted for our area,” said Rebecca Esselman, Watershed Planner at the Huron River Watershed Council (HRWC). 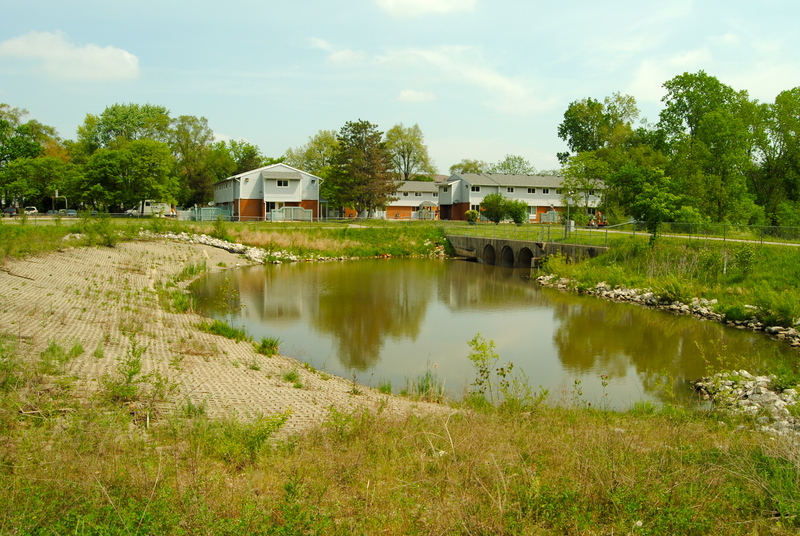 Ann Arbor’s stormwater utility has existed since 1984, but a new funding structure in 2006 began to charge property owners based on the amount of impervious surface on their property. In other words, the more square footage of pavement or other non-absorbent surface area you own, the more you pay into the system to manage the stormwater that runs off your property. The more pervious surface—like vegetation—you have, the less stormwater you send through the city’s infrastructure, and the less you pay. “To be a utility, you have to be able to use more or less of it,” Naud explained. 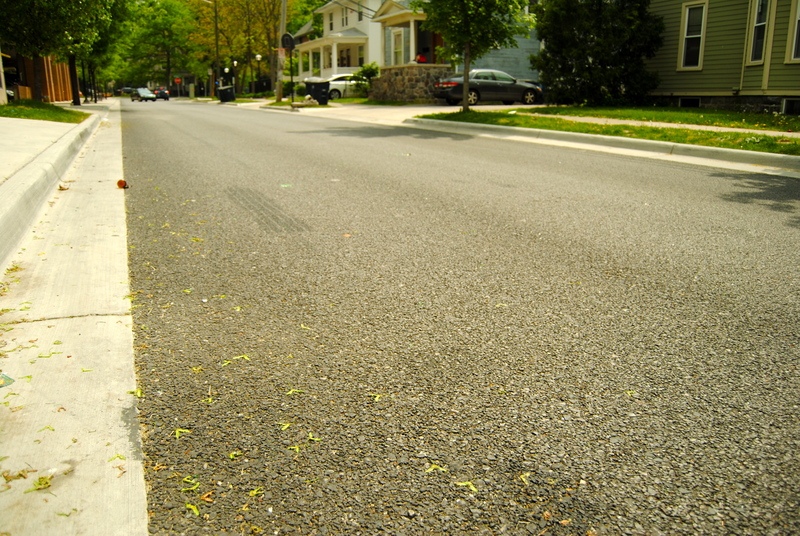 An example of pervious, stormwater-absorbing pavement on Willard Street in Ann Arbor. Current stormwater utility rates in the City range from $13.68 per quarter for properties up to 2,187 square feet of impervious area to $71.82 for properties over 7,110 square feet of impervious area. Previously, all property owners paid a flat rate of $22.75 per quarter, regardless of the size or pervious-ness of their property. While similar stormwater utilities in Michigan have faced opposition, Ann Arbor’s stormwater utility has avoided legal scrutiny partly because of the level of detail by which the fees are determined. We looked up the flyover image for our own house in Ann Arbor. 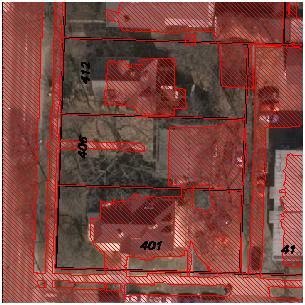 The red areas indicate impervious pavement used to determine our stormwater utility rate. New technology allowed the City to do a flyover of every property in town, using infrared to determine pervious/impervious surface at two-foot resolution. Property owners can type their address into the City’s homepage to view their parcel and send in corrections by highlighting any areas they think have been misclassified. As of 2011, 632 parcel-owners out of almost 25,000 total in the City had submitted corrections. Homeowners can also lower their stormwater utility rates by making improvements on their property, either by decreasing the amount of impervious surface or by installing simple technologies that retain stormwater on-site. Rain barrels earn a credit of $1.96 per quarter and rain gardens, cisterns, or drywells are worth $3.06 per quarter. Though the monetary savings may not be a huge driver, rain barrel workshops and other educational outreach have led many residents to try out some of these home stormwater treatments. As of 2010, 5,473 credits had been claimed, indicating residents’ engagement with the stormwater utility. Overall, though, the most significant impact of the stormwater utility comes not on individual parcels but in the larger infrastructure projects that it helps fund. Mary Beth Doyle Park, for instance, has the capacity to hold 15 million gallons of water; its wetland is planted with deep-rooted herbs and grasses that slow down and clean stormwater. A berm in the flood-prone stretch of Mallets Creek diverts flow into the park wetland, protecting nearby homes and roads. What do you think of Ann Arbor’s stormwater utility rate structure? Could/does it work in other cities? Start the discussion below. Pingback: Ann Arbor’s storm water policies praised as "climate-smart"
Looks like about 20% of the citizens have made some measures to decrease their runoff and reduce costs. That’s a lot more participation than I would have expected. It’s amazing how much advances in technology can help with these sustainability measures. Not just IR imaging to do classification of the surfaces. Airborne lidar to make 3D maps of areas is becoming more and more affordable. Topography is available in resolutions you could never have achieved 15 years ago, at any price. That can go a long way to making better planning and civil engineering decisions. This all sounds very positive, and in theory it is. In practice, perhaps not so much. In Ann Arbor (where I have lived 70% of my life) tree maintenance (pruning, prolonging tree longevity) was abandoned 10 years ago. Funds provided by the stormwater utility are rather used to cut down aging trees (some of them need to be removed), to plant new, smaller trees, and to do “studies.” The value of trees is not respected as much as this article might imply.